This discussion-oriented class reads scripture and discusses the application of theological concepts to every-day life. This class offers family and faith-based short-term studies. The group enjoys special outings and participating in various mission opportunities. This class offers members and their families support and prayers, social activities, and an opportunity to engage in contemporary “hot” topics that are relative to faith in today's world. The group also participates in several mission projects sponsored by the church. New members, both singles and married couples, are welcome. This Sunday School class seeks materials, both modern and ancient, to find Christ’s purpose for each of us. The class plans social gatherings annually, and also supports and participates in church-wide projects. Couples and singles are welcome. The Young Adult ministry is in the process of regrouping to create fresh ideas for class and fellowship. A brainstorming session and group game night are being planned this fall. All young adults are invited to take part in the planning of our new group! Discussions and activities are designed to help teens establish a grasp on the Bible and to experience the gifts of others through missions, community projects, and personal relationships. Our Nursery provides a safe, loving place for babies and toddlers while their parents participate in the ministries of the church. These include Sunday morning worship, Bible studies, Wednesday Niters, Choir and Praise Band practices, and special services and events. For more information, please see Kern’s Nursery Brochure or contact our Nursery Coordinator below. Children experience Bible stories through age-appropriate curriculum and interactive play. Children experience the Bible through stories, crafts, and other hands-on activities. Children experience a more in-depth study of the Bible through reading scripture, thought-provoking games, skits, hands-on activities, and interactive discussions. This class offers a deeper study of the Bible and Biblical truths on tough issues that “tweens” face today. This year, the class is focusing on a study of the New Testament. Discussions are interactive and informal, welcoming individual opinions, feelings, and ideas. Sixth graders are invited to participate in Confirmation classes, which are held during the latter half of the school year. Watch for details on Confirmation later this Fall. All 5th-12th graders are invited for a time of recreation, games, food, and learning together in a fun group setting. The fellowship is also seeking ways to serve our church and our community. Bring your Bible and join Pastor Dan Taylor in an in-depth study and ongoing discussion. Parkinson’s Disease is a brain disorder that occurs when certain nerve cells become impaired. This disease is chronic and progressive. Be part of this self-help group that learns ways to improve lifestyle through greater understanding. Care support partners are welcome to attend too. Lunch is provided. This 9-week study will help participants learn what it means to be citizens of the Kingdom of Heaven. We’ll sit on the mountaintop at the feet of Jesus, asking for ears to hear and hearts to respond to the teaching of our King. This group provides maintenance and general repairs to Kern facilities, as needed. They meet for coffee and prayer, fellowship and support, before working. This women’s Christian fellowship group comes together to grow in Christ, as well as to reach out in mission to other women, children, and youth throughout the world. In addition to the monthly General Meetings, dinner meetings are held during the months of September and December. Several circles meet in the homes of individuals at scheduled times throughout the month. UMC welcomes women to get involved in various mission opportunities. For more information on Circles or our Reading Library, please contact our UMW President or a member. Using a story about the reconciliation of once-bitter enemies teaching others, this study will walk us through how to transform personal, professional, and global conflicts, even in the face of great obstacles. The bishops of the United Methodist Church recommend this book with the questions facing our denomination in mind. Cost of book is $12-$15. This men’s Christian fellowship group prepares and shares in a meal, followed by a brief program. The group enthusiastically invites men (and women) to participate in meetings and service activities. New ideas for service are always welcome. Wednesday Niters are offered August through June for the entire family to share a meal together and then remain for fellowship, a special program, or to attend a variety of short-term classes or activities. Cost is $7.00/person or $25.00/ family for the meal (under 7, free). This six-week class will be half lecture, and half group discussions. Reading assignments will be given, but no exams!!! Class participants will decide together future study topics. Kern’s Chancel Choir provides musical leadership for the 11:00 am worship service. We sing a wide variety of anthems and lead the congregation in responses and hymn- singing. During Advent and Holy Week, the choir presents special music and programs. The Chancel Choir meets year-round. Kern’s Praise Band provides musical leadership for the 9:00 am Contemporary worship service. We sing a wide variety of popular contemporary songs, as well as well-known hymns, and lead the congregation in praising and worshiping God. During Advent and Holy Week, the choir presents special music and programs. The Praise Band meets to practice year-round. Kids (ages 4 through 4th grade) are invited to share in Bible stories, crafts, and other activities. This fall, our Devotions are on the Fruit of the Spirit. These classes are offered in conjunction with our Wednesday Niter ministry. Together we’ll learn how to apply this study to our lives to fight against greed, materialism, and overindulgence. The goal of the study is to help us all consider what Jesus’ version of rich, blessed, and generous might look in our lives. Books are recommended, but not required (available at Amazon.com ($14.95-book, $18.95-workbook). Have you ever wondered about things like, what's in the Discipline, how did the United Methodist Church come to be, why are there different kinds of Bibles, and other things that happen at "church"? Join me for lively discussions and information you can use! Hookers & Needlers - 6:30 pm (Fellowship Hall)—Group has a NEW Name! This fellowship group centers on a common interest, namely crocheting and knitting, but other hobbies go on too. There are group projects and personal projects, and many group projects are given to a good cause. Don’t know how to knit or crochet? We’ll teach you! Lift up and support the pastor, staff, leadership, and the church, by making a personal pledge and commitment to pray regularly and consistently for our church. Join us each Thursday morning for a more intimate and focused prayer time to pray both with and for our pastor and church staff; we also share and pray over church concerns. For anyone interested in exploring the hobby of photography, learning new aspects of photography, expanding photography skills, and sharing the “moments you have collected” with your camera (or smart phones), join others of similar interest to discuss and share photography related topics. Contact: Terry Allen (visit his website www.photostba.com —or just come to class! Are you interested in a small group that is NOT listed? This website contains a sampling of the various classes, Bible studies, and small groups that are available at Kern UMC. You do not have to be a member of the church to participate. We both welcome and encourage others to join us. In addition, we are always seeking new ideas and opportunities to bring people together in small group ministries. If you would like to lead a small group or participate in a study that is not included in this list, please let us know. Please complete the sign-up sheet inside your bulletin or call the church office. Your name will be given to the appropriate class leader. For complete information on all of our current and ongoing small groups, please download a copy of our Fall 2018 Small Groups brochure. copyright 2018 by Kern Memorial United Methodist Church. All rights reserved. 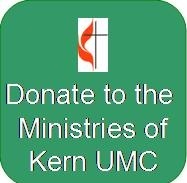 Click on the Donate button if you wish to use our secure donation website to contribute directly to the Ministries of Kern UMC. If you wish to establish a routine donation directly from your checking or savings account, you may print out the following form, fill in the information requested, attach a voided check or savings deposit slip, and mail or bring it to the church office. If you wish to complete a 2019 Annual Giving Commitment Form on-line, please follow this link 2019 Annual Giving Commitment Form. Click on the Pulpit above to listen to Kern Sermons using your computer's media player. You may also listen to our Podcasts on iTunes at Kern UMC Sermons.